We all remember our first. I know I do—he was a swarthy lothario from Mauritius. He took me by the hand and showed me what to do, step by step. He praised my handling skills, and encouraged me to be even more dextrous. Although he led the way at first, it wasn’t long before I felt in control and ready to move to the next stage. Sadly, the relationship ended when he moved overseas, and number two took me backwards. He was critical, overly controlling and wouldn’t let me touch anything. He insisted on working through the manual before allowing me any tactile experiences. It didn’t last long. I left him for number three, who taught me how to relax. ‘It’s like dancing,’ he declared. Number four left me for a big career. Number five wanted to spend more time with me than I with him. Number six was a bully who made me cry. Number seven took me as far as he could, and then handed me over to his friend, Number eight, to finish the job. Number nine was a lovely lady who showed me a whole bag of new tricks, and number ten had the patience of the Dalai Lama but absolutely no sense of humour. Number eleven was number three revisited, and numbers twelve and thirteen are better forgotten. Number fourteen, the current man in my life, is a little bit of everything I want and need—patient, funny and very, very calm. He might not be Mr Right; he might only be Mr Right Now. But that’s good enough for me. Monogamy isn’t for everyone. I have now ended my quest for ‘the perfect instructor’—a quest that has taken me on an Everest-sized climb for ‘the one’, only to discover that there is no ‘one’. Not for me, anyway. instructors are people, too and that the student/instructor relationship is exactly that—a relationship. Relationships are about compatibility, compromise and communication. Nowhere is this truer than in the relationship between instructor and student. This person will have a huge impact on our lives: they are teacher, mentor and support person, but in addition to this, they are the person from whom we will learn our habits, our airmanship and our safety mindset. And yet, perhaps we fail to place emphasis on the importance of compatibility in our relationships with our instructors. While the relationship must be a professional one, it’s also very individual and personal. For many, it’s the first time since adolescence we’ve put ourselves in a student/teacher relationship. We may be successful professionals in our careers, and suddenly we find ourselves in the often-vulnerable position of being a student, sometimes with a teacher a great deal younger than us, possibly with a whole lot less, in terms of life experience. Learning to fly demands a series of different skills that stretch a student’s physical, mental and emotional capacities. While the mental demands of flying are acknowledged, and the physical obvious, the emotional support required in learning to fly is often ignored. More than 75 per cent of the students I interviewed for this article conducted very little research when acquiring their first instructor. Most simply went with the instructor with whom they’d flown their TIF. Only one sat down before their first flight and discussed the instructor’s teaching style to assess for compatibility. The respondents’ answers showed a ratio of 2:1 of horror stories versus positive experiences with instructor/student relationships. With this in mind, I compiled a brief guide to improving communications with instructors, based on my own experience and those I interviewed. Before sourcing an instructor/new instructor, think about the qualities you’d like in your ideal instructor, this person with whom you are going to spend a great deal of quality time. Do you need someone with lots of empathy? Or would you work better with a structured teacher? How important is sense of humour? Humility? Are you culturally compatible? By that, I don’t mean do you share the same racial background; more are you on the same wavelength? If your instructor is racist, misogynistic, lacking in empathy, there may not be a sound basis for a workable relationship. Conversely, if you abhor ‘political correctness’ and enjoy light-hearted banter, and your instructor is offended by your humour, you’re not on a level playing field, or in an environment conducive to learning. In addition to aeronautical maps and mud maps, there’s a third map, essential in the relationship between instructor and student—the map of the future. 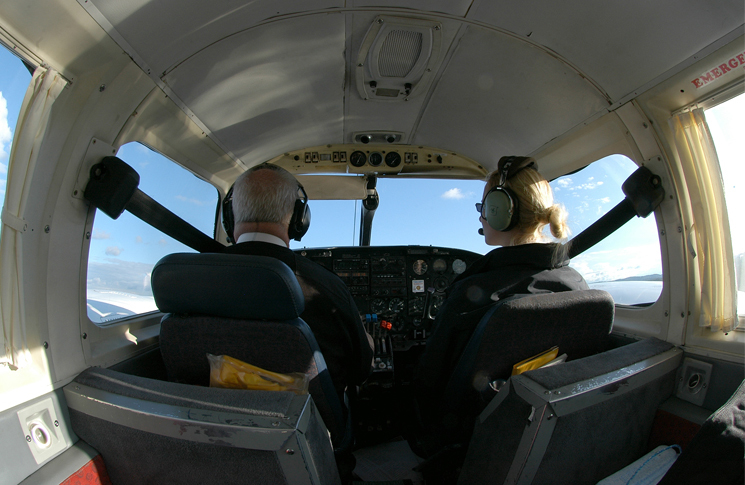 Sit down with your instructor and talk about what you want in your flying training. The instructor should have a plan for your training in terms of the milestones, exams and lessons, but also a plan for communicating. Debriefing after your flight is essential in terms of progression. Be sure you debrief with your instructor after every lesson, and use the opportunity to discuss how the flight challenged you. Did you feel frustrated or elated? Discuss your progression, and raise any difficulties you have in this session, on the ground. Not all instructors make a career in instructing. A conversation about your instructor’s career intentions isn’t impertinent; it’s good planning. Find out if she/he plans to leave, and when. Their leaving doesn’t necessarily preclude your flying with them, but the timing needs to work out for you, too. Responses from the instructors I interviewed show a very different story regarding communicating with their students. Most of the instructors had a flight bag full of strategies and resources to help students who are struggling with the technicalities of learning to fly. Nearly all agreed a sense of humour and unlimited patience are prerequisites for the job. Unsurprisingly, not one argued against a better pay structure. And finally, almost all agreed that no matter how skilled a teacher one is, the success of an instructor/student partnership largely depends on compatibility. While interpersonal skills are taught briefly in the instructors’ rating course, the breadth of the course material means that comparatively little time is spent teaching communication skills. The more mature, old-hand instructors interviewed for this article declared that they have picked up communication techniques over time, through trial and error, or through experience in other areas of their lives. Here’s their advice on the art of communication. Retain control. There is nothing worse than a short-fused instructor. Shouting says you have lost control of the situation. If you look like you have lost control, how is the student going to trust you? Trust is a vital component in the student/instructor relationship. If you do blow a fuse, apologise and discuss the situation in the debrief—Pete. Know your student. A good instructor has to be able to adapt what they do for individual students. Some need stern, some need keywords, some need prodding, some need nagging, some need sarcasm, some need full sentence explanations, some need a combination of the above. Remain sensitive to their needs—Bruce. He proceeded to apply full power, pulled the nose up and slammed in full right rudder, throwing the C150 on its back. When he saw the look of terror on my face, he repeated the manoeuvre. I nearly gave up flying right there and then. Luckily, I hung in there and became an instructor myself. I never ever want to see that look on my students’ faces!—Tex. R.E.S.P.E.C.T. I’ve taught students I don’t actually like much as people, but that doesn’t necessarily make them hard to teach. What matters whether the relationship is based on respect. If the student doesn’t respect me, maybe because I have been short tempered with them; or I don’t respect them, say because they have not attempted to learn their aircraft data, then it’s going to go pear-shaped, pretty quickly—Tim. If the only tool you have is a hammer, its amazing how everything appears as a nail—From my perspective effective communication is built from developing a strong level of trust, like any solid relationship. It’s imperative that instructors spend time getting to know their students and how they like to learn. Students bring a wealth of knowledge, skill and experience to their flying and understanding that background can be the catalyst to a very productive relationship. If the trust is in place, the communication will flow and the experience for both will be rewarding!—Gary. And the Oscar goes to—instructing 10% skill, 10% knowledge and 80% acting!—Thomas. You don’t want to be downwind of anyone’s wind—even in summer, body odour is unacceptable in the tiny confines of a GA aircraft—and that goes for both of you! The briefest of debriefs—while instructors are usually time-poor (and often paid only per flight) it is not acceptable for an instructor to leave you hanging at the end of a lesson. If the debriefs are too brief, or the instructor alights at the end of the lesson and takes off with the next student without discussing your lesson, this is an issue you need to address. If the instructor has to work back-to-back, consider a phone call in his/her down time. ‘Hold the stick like it’s a gentlemen’s member?’—No way. Leave. Now. My way or the highway—every teacher has their own technique, but if you’re finding your instructor isn’t open to discussing the lesson, or explaining a component of your flight, then think again. Won’t let go—35 hours in the circuit and no improvement; an instructor who takes over on short final, feeling that pressure on the rudder pedals? It might be time for you to let go…of this instructor. The best article on instructing I have seen. Every word is pure gold. Brings back the old adage: “people will forget what you said; people will forget what you did. But people will never forget how you made them fee”. John, did you mean “…. will never forget how you made them feel” or did you really mean fee? Either way works I guess!